“I have just learnt with much sadness of the passing of Mrs. Juliet Barnwell, MVO, and wish on my behalf and my family and on behalf of the Government of the Commonwealth of the Bahamas to express our heartfelt condolences to her family at their loss. Our thoughts and prayers are with you at this time. Mrs. Barnwell was the scion of a very distinguished Bahamian family. Both of her parents, the late Dr. Claudius Walker and her mother Mrs. Mable Walker were distinguished in their own rights. 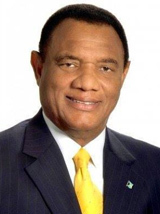 Dr. Walker was note for his involvement in the field of medicine and community development and for having served as a member of the House of Assembly. Mrs. Barnwell’s mother, Mrs. Mable Walker, was born in the United States of America, but made The Bahamas her home where she distinguished herself as an outstanding educator and as a trades union activist. Both of Mrs. Barnwell’s parents have been given public recognition through the naming of public institutions in their honour. For her own part, Mrs. Juliet Barnwell was a brilliant educator who taught several generations of Bahamians. She went on to serve in senior professional positions in the Ministry of Education where she continued in her pursuits to improve the standards of education in our nation. She became a senior public administrator and had the distinction of serving as the first Bahamian Secretary to the Governor General. She displayed much tact and efficiency in this role and set a standard for others to follow. She went on to serve in other senior administrative positions in the Public Service until her retirement. Mrs. Barnwell was notable in having been an early pioneer in the Co-operatives movement in The Bahamas and was very much involved in the management of several of the Co-operative Societies. On her retirement she threw her energies into community and other work and was a part of several non-governmental as well as public boards and committees. Her last such appointment was to have been appointed by the Hon. Melanie Griffin, Minister of Social Development, as Chairman of the National Council for Older Persons. In this role, she effectively brought to the attention of the Government many of the issues affecting Older Persons and sought to ensure that appropriate policies were put in place to improve their conditions. Mrs. Barnwell was very much involved in the promotion of the legacy of Over the Hill and the Grants Town Community from which she came. She took great pride as head of the Hospitality Committee of Christ Church Cathedral where she worshipped. All told, Mrs. Juliet Barnwell was a woman of many stripes and her entire life’s work was focused on the upliftment of her beloved Bahamian people.